Haiku poets celebrated the New Year by writing haiku, painting haiga, or taking pictures, and so on. 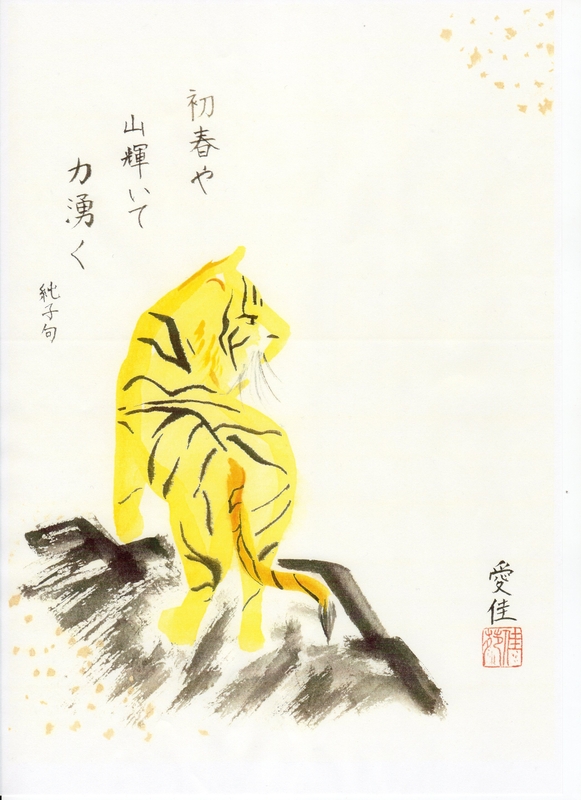 Masuda Aika（桝田愛佳）painted haiga to celebrate the Year of the Tiger in Akita, Japan. Masuda Junko（桝田純子）, Aika’s mother, wrote haiku for her sister, who is expecting a baby 13 years after her marriage. Roberta Beary wrote haiku at her family reunion in Washington, DC, USA. Emiko Miyashita（宮下惠美子） wrote haiku at her mother’s family reunion in Fukushima, Japan. Fay Aoyagi（青柳飛）wrote haiku in celebration of the 1st anniversary of the birth of ‘Today’s Haiku’ in her blog ‘Blue Willow Haiku World’ in San Francisco, CA, USA. She has been introducing many haiku as possible, translating them into English for non-Japanese readers. Yousei Hime wrote haiku in a challenging way on New Year’s Day in Michigan, USA. Gabi Greve took pictures and wrote haiku in Okayama,Japan. John McDonald writes haiku in Scots – one of the two languages native to Scotland (the other being the celtic-rooted Gaelic). He also translates it into English in Edinburgh, UK. Marshall Hryciuk wrote haiku in Toronto, Canada. Joshua Sellers writes haiku in West Memphis, Arkansas, USA. William Sorlien writes haiku in St. Paul, Minnesota, USA. He says they have just had an unusually harsh cold spell, lasting from Christmas to now. Temperatures never rose above freezing, and averaged around – 20 C.
Louis Osofsky writes haiku in Quincy, CA, USA. John Tiong Chunghoo writes haiku in Malaysia. P K Padhy writes haiku in Bhubaneswar, Orissa, India. RAM SHARMA writes haiku in MEERUT u.p, India. Ettore Mosciano writes haiku in English as well as in Italian in Rome, Italy. Alberto Savoi also writes haiku in English as well as in Italian in Venice, Italy. this path is still long. Last of all, let me post my haiku and a picture of Mt. 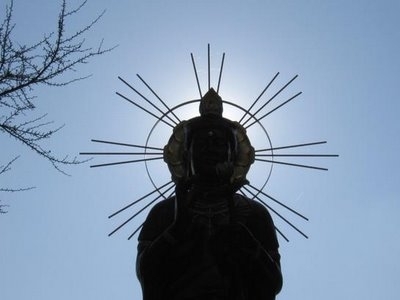 Taihei in Akita, Japan. 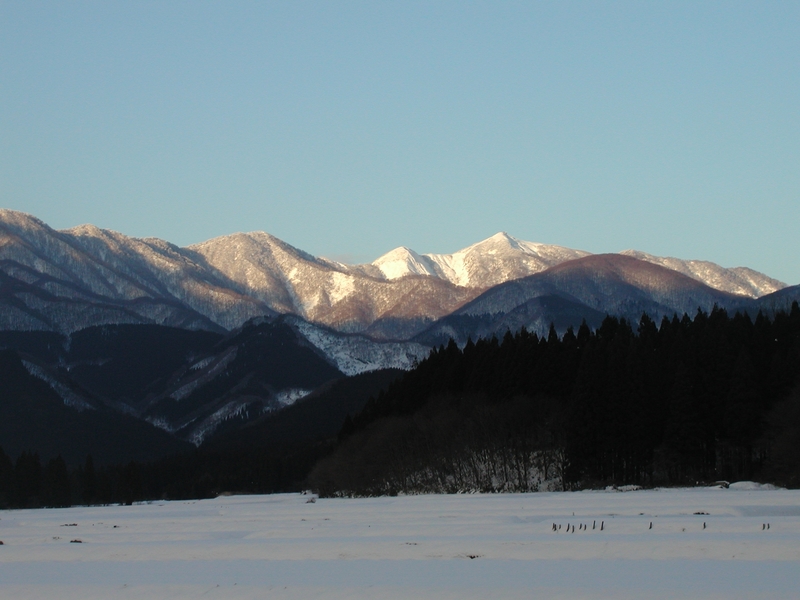 Exciting post, expressing the heart of the Akita International Haiku Network. There are so many beautiful haiku. Thank you for this opportunity to be a part. Happy New Year to all, writers and readers. These are delightful! I’m so honored to have been included. Thank-you, Hiruta San. I enjoyed every one of these and Haiga and Photos, too. I do enjoy reading haiku poems published in Akita Haiku International. I have the pleasure to read the haiku written by John McDonald.I highly appreciate your endeavour for taking pain in translating the poems.It is indeed a noble effort for the cause of world literature. Would yo mind correcting the spelling of my surname as Padhy instead of Phdhy as typographically recently printed. I thank You and Akita International Haiku Network to have had attention for my haiku, to have included it in your impressive anthology. Best regards to You and all poets in the site!